John has been an active crew member with the Blue Fathoms since 1995. He has been diving since 1989 when he made his first scuba dive on a spring break trip in college. He did his divemaster training in the Finger Lakes of NY (cold pea-soup diving). He has held teaching certifications with PADI since 1993, and TDI since 1996. He taught open water scuba classes at Rutgers University for nine years, his preference is to be in the ocean instead of a swimming pool. 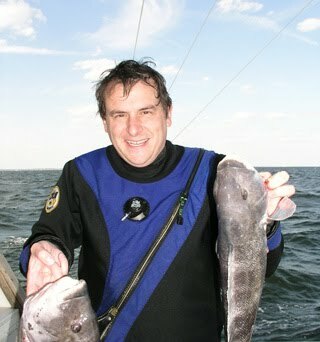 John has made dives extensively in New Jersey waters as well as the Caribbean. He enjoys is Northeast diving, and his favorite dive to date has been the RP Resor in 1998 with a small group of divers off of the Blue Fathoms. His local favorites are the Tolten and the Gulftrade.